These are 35mm photographs which were then retaken with a digital camera. No scanner so they aren't the best. You will need to do some scrolling here if you aren't using a very high screen width, sorry for the trouble. Comet Hale-Bopp during it's 1996-97 visit, Big Dipper left of center (standing on end), and a full moon. Concrete ponds (when they were newer). The upper 3 levels of a 3 part system containing a fountain and waterfall, also gas flame (these are not seen here). Small goldfish are just visible right of the cactus plant. They saw me and wanted food. 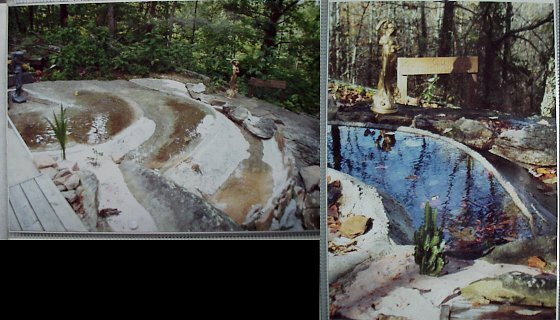 Rock which makes a natural birdbath when not frozen (birdseed and two birds there) and girl statue in lights at left. The lowest section of the 3 part ponds containing the waterfall and gas flame (fountain not seen here either). Left photo shows before the place was lived at, center is where the waterfall is (not seen due to direction at lower right corner) with the gas flame burning bottom mid-right (those are two low voltage lights on either side of the "hole"). Water pumps up from here back to the first 3 levels. And right photo is same place with snow obviously. Fire pit with rocks and logs surrounding it. Left has fire burning and right does not (that's the sunrise) ha ha. Another pond on the uphill side with waterfall (flows over large rock when water is present). Left photo is again before anything done, two middle photos show before and after concrete. And almost complete on the right is the fountain and gas flame viewed from above. The flame isn't easy to see once again but it's just down and right of exact center, fountain is more obvious lower right.